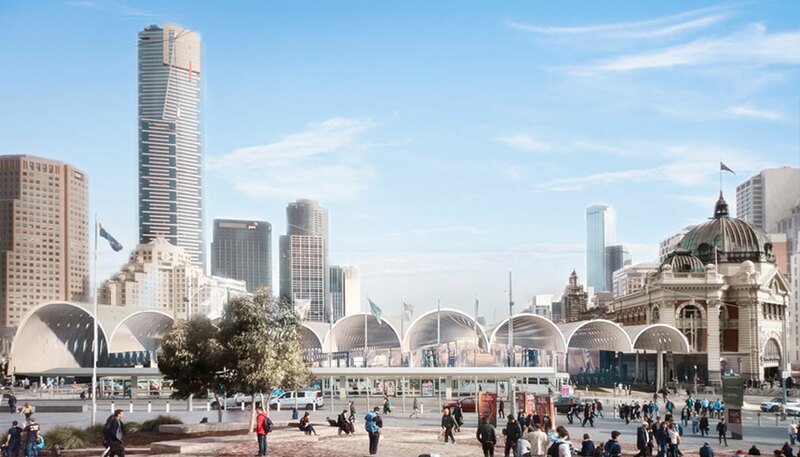 Recently the Melbourne media has reported that the winning design for the Flinders Street Station Design Ideas Competition by Hassell and Herzog & De Meuron would cost a whopping $2 billion to build. Naturally this has drawn many to question the wisdom in undertaking the design competition in the first place. After all if we cannot afford to build it, what is the point? So did the Victorian taxpayer get value for money out of the Flinders Street Station Competition if the final design might cost $2 Billion? Absolutely yes! Even if the winning design is never built the $1.6 Million spent is some of the hardest working taxpayer dollars that the government has spent. The $1.6 Million bought a massive amount of professional advice. Under ordinary circumstance the same advice would have likely cost over $11 Million. Warwick Mihaly on Panfilocastaldi did the following rough calculation on the hours spent by architects. How much would it cost to commission 10 of the world’s best painters or sculptors to each prepare a substantial piece of work? Once you then add in 108 other artists from around the country it would clearly be substantially more than a mere $1.6 Mil. As a comparison the federal Government in 1973 purchased a single Jackson Pollock painting Blue Poles. The price paid by the federal government in 1973 equates to approximately 10.9 million dollars in today’s currency. I would argue that the work of Zaha Hadid (just one of the entrants) is at least as influential in the architecture world as Jackson Pollock’s work in the art world. If we are serious about artistic endeavour we need to invest in a wide variety of art forms. To take another example of an artistic endeavour, the State and Federal Government both pour substantial amounts of fund into the film industry. I am not for a moment suggesting that this support is a poor investment, but rather highlighting how comparatively small the investment in the architectural competition by comparison. Indeed given that the final six designs all featured animated fly throughs, there is no reason why this couldn’t have been partly funded within this larger budget. To make even more out of the money invested in this competition, a physical travelling exhibition should be established to showcase the cutting edge work. Only a fraction of the design proposals have been seen by the vast majority of the public and this is therefore a golden opportunity to further the value of the competition. How much would a 19,000 person focus group to discuss the future of Flinders Street Station have cost? I honestly don’t know but I would think at least $50 per person ($950,000 total) under normal industry circumstances would be a starting point. As part of the competition the community were offered the opportunity to provide their feedback on 6 potential designs. Their opinions were not moderated and the report that was generated provides a great deal of feedback for a way forward. Even if we cannot afford to start building today, there is an inherent value about having a long term plan for our most important landmark. Flinders Street Station is not going anywhere. It will likely be around beyond the lifetime of anyone living today. If we refine the plan further, or if we pursue a new design in the future based on what we have learnt from this process, it will still have been worthwhile. There are some who say that architects were just ‘in it’ for themselves and that this competition was just a method of handing architects money. There is categorical proof that this is not the case. Even the winner will likely have lost money on this competition having been paid $500k. The numbers just don’t stack up. The number of hours put in to generate the quality required far outstrips the prize. It is the equivalent of saying doctors who volunteer in third world countries are only doing it for the free flights and accommodation. So why did architects participate? There are many reasons. The big firms are definitely in it to win it. It might strengthen their ability to be given other projects or raise their profile. For the small architects it is far more about participating in the culture of architecture than being a sensible business decision. Architects feel a duty to the built environment. For them it is about being part of the discussion, providing alternate possibilities and helping to ensure that the winning design is the best by being compared with the rest. PS If I still haven’t convinced you that it was worth spending $1.6 Million on the competition, perhaps we could just shorten the 8 Kilometre East West Link tunnel by just 160 Centimetres and get that money back! In fact we could scrap the entire $18 Billion East West Link Project and finance the construction of Flinders Street Station and eight other major projects like it for the same price! If you are concerned about a waste of money, start there! This entry was posted in all posts, Flinders Street Station Design Competition, Government Policy, News, Uncategorized and tagged Architecture competitions, Blue Poles, Flinders Street Station Design Ideas Competition, Hassell, Herzog & De Meuron, Jackson Pollock, Value for Money. Bookmark the permalink. 2 Responses to Was the Flinders Street Station Competition Value for Money?